The title is literal and metaphoric with a slice of licence. In my first post from Giant’s Castle last week, I featured the Bearded Vulture, an endangered mountainous region’s unique bone-eater. The national park supplements the food for these endangered Bearded Vultures which birders and photographers put out in front of the vulture hide. Inevitably, by putting out the bones, this food source attracts an assortment of other scavengers. Many of the bones have been sawed in half exposing the bone marrow which opens up the variety of avian opportunists one is likely to see. The fat on and marrow in the bones attracts a wide variety of wildlife. 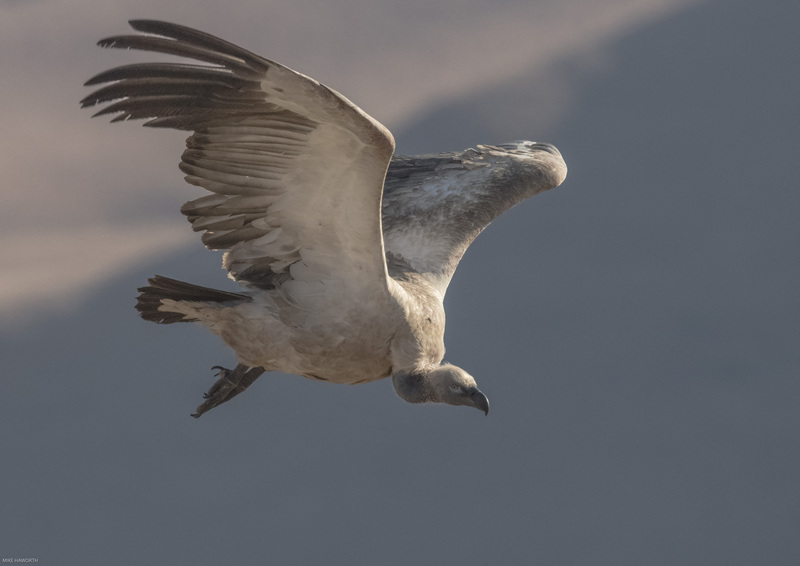 In this post I will show you some images I took of the Jackal Buzzards, the Cape Vultures and a Black-backed Jackal which came to partake in the feast in front of the vulture hide. I reiterate that under normal circumstances, feeding or baiting the wildlife for photography purposes is not allowed. The feeding of the Bearded Vultures at the Giants Castle hide is a special situation encouraged by the national park. The hide is located on a ridge about 1500 metres above the Bushman’s river valley floor. The ridge provides perfect updrafts for the raptors to approach the hide. In winter, we get into the hide around 6h30, around half an hour before sunrise. As the first horizontal rays of sunlight blazed onto the hide’s foreground many birds were ready and waiting, mostly Red-winged Starlings and White-necked Ravens. 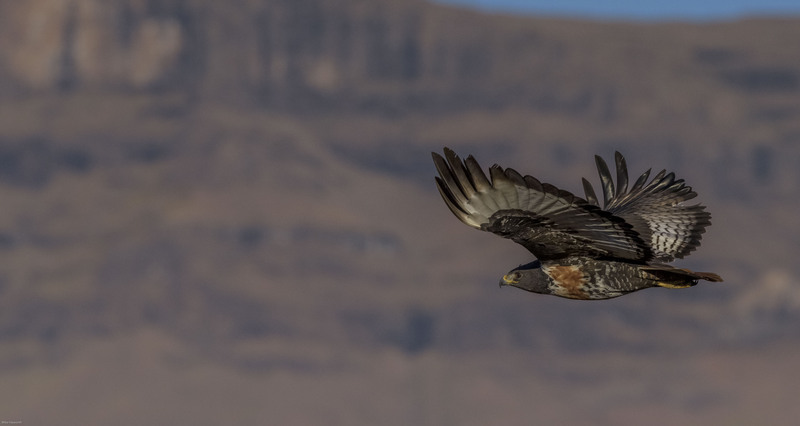 One of the first visiting raptors to the hide’s breakfast table was a Jackal Buzzard. 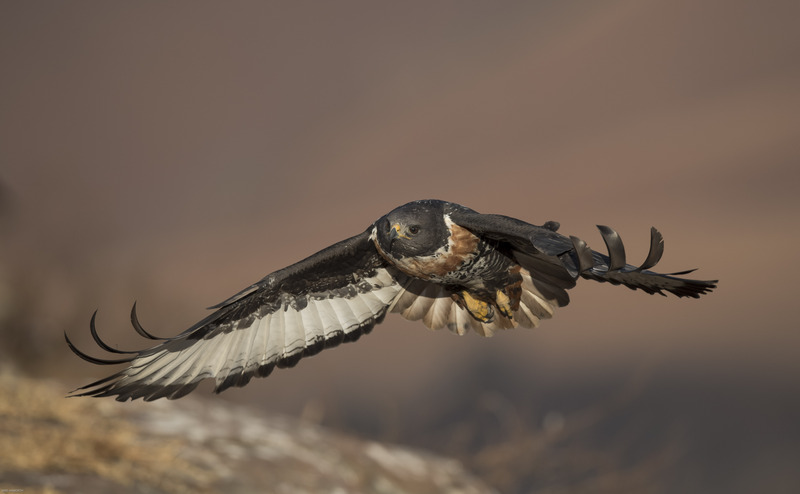 The Jackal Buzzard is endemic to South Africa and the southern parts of Namibia. The English name of this bird comes from the loud yelping calls, similar to those of the Black-backed Jackal. 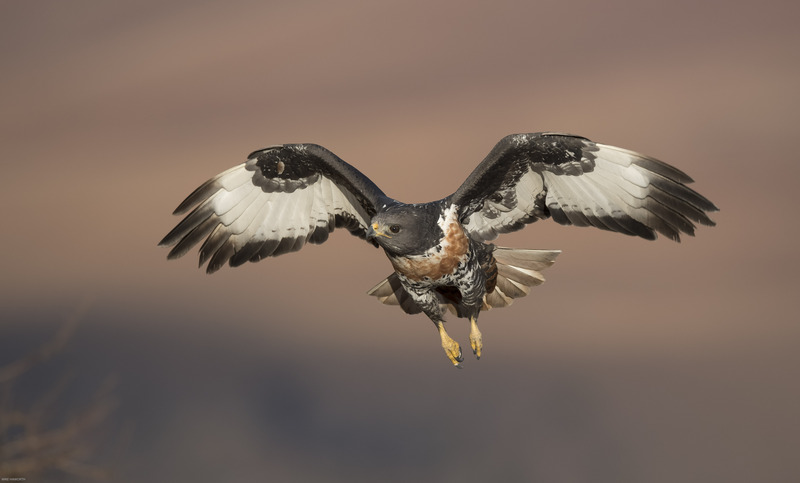 The Jackal Buzzards are perch hunters but if necessary will take to soaring to look for food . The Jackal Buzzards near the vulture’s hide have become habituated to finding food at the hide and seem to visit every day, and often more than once a day. The Giant’s Castle vulture hide’s breakfast table with a spectacular backdrop. 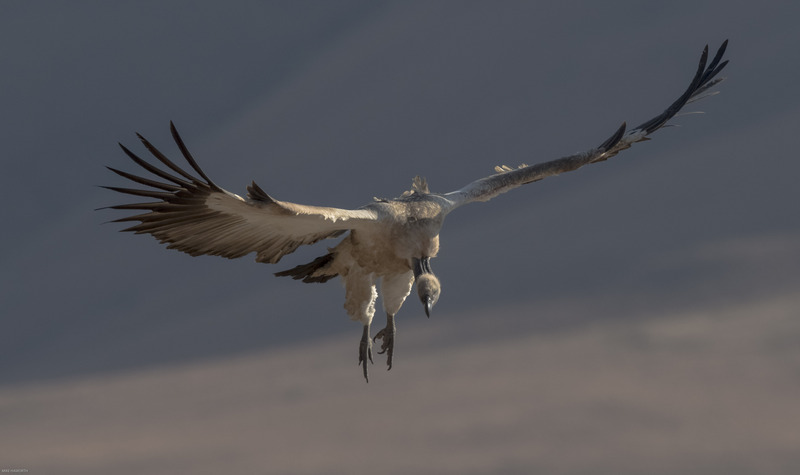 The bones put out to feed the Bearded Vultures also attract the Cape Vultures. This is one of the southern Africa’s largest vultures with a total length of just over one metre and a wingspan of around 2.5 metres. 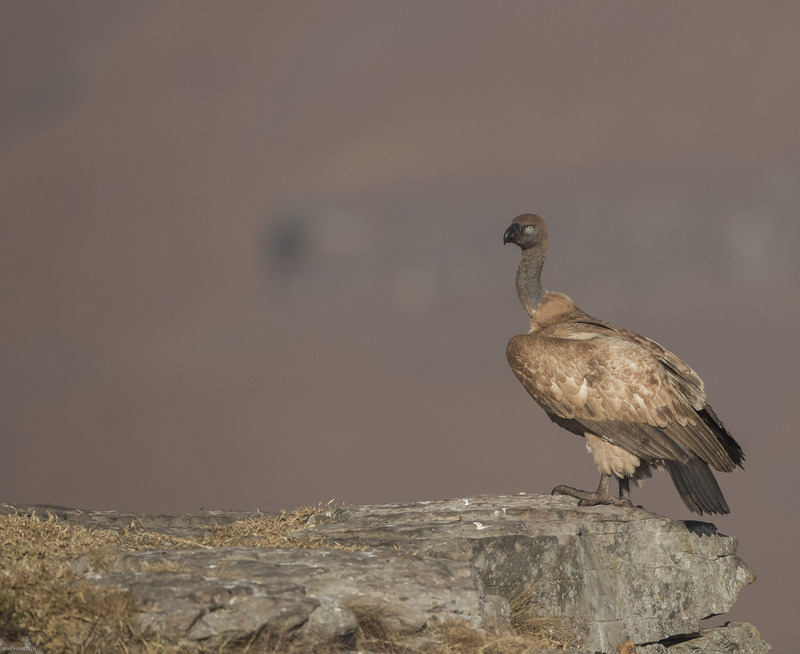 This large vulture has a creamy-buff colour, with contrasting dark flight- and tail-feathers. 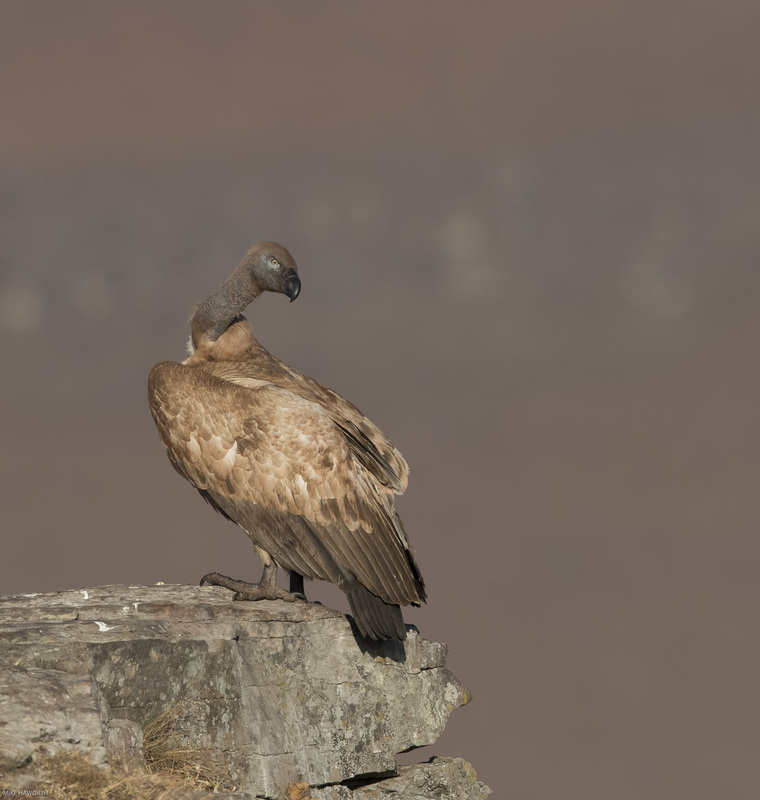 The head and neck are almost bare skin as seen with the Lappet-faced and White-backed Vulture implying that they get their heads right into the carcass when feeding. The eye socket has a bluish tinge and the eye is yellowish and the beak is black. 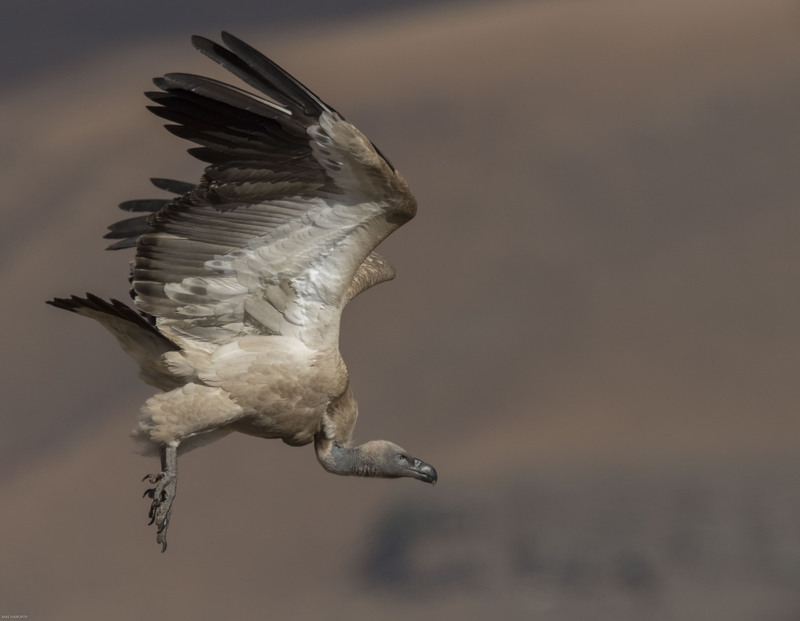 Since 2015, the Cape Vulture has been classified as endangered on the IUCN Red List. The global population estimate has been revised to 4,700 pairs or 9,400 mature individuals according to IUCN but the population is declining overall but interestingly is reported to be increasing in select areas. Apart from a slight size difference (female larger) there is little difference between the sexes making it difficult to differentiate between male and female. As with other vultures these raptors are superb fliers. 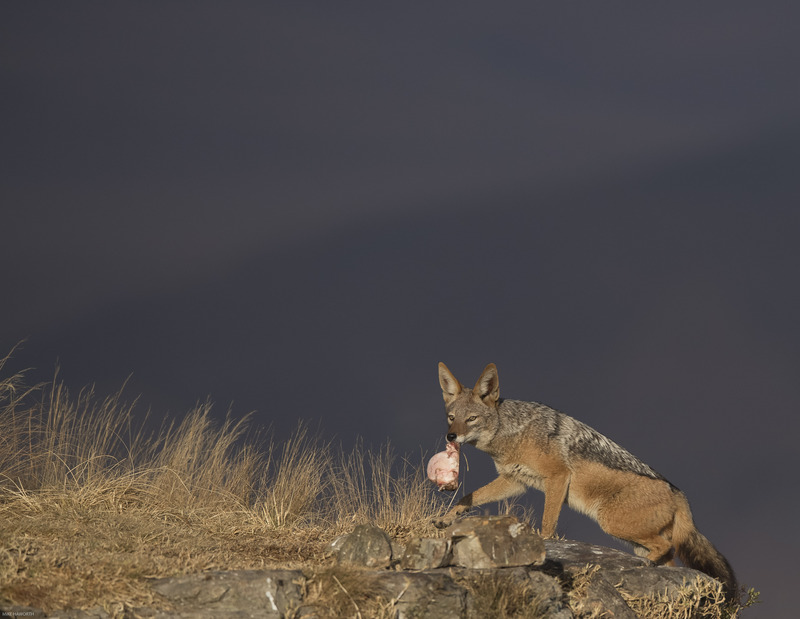 Black-backed Jackals regularly visit to hijack the bones in front of the hide. They have found this to be a convenient source of food. Usually one Jackal arrives and does not seem to fuss when the White-necked Ravens are around. By contrast, the Jackals have been known to get into a tangle with the Cape Vulture over ownership of the bones. 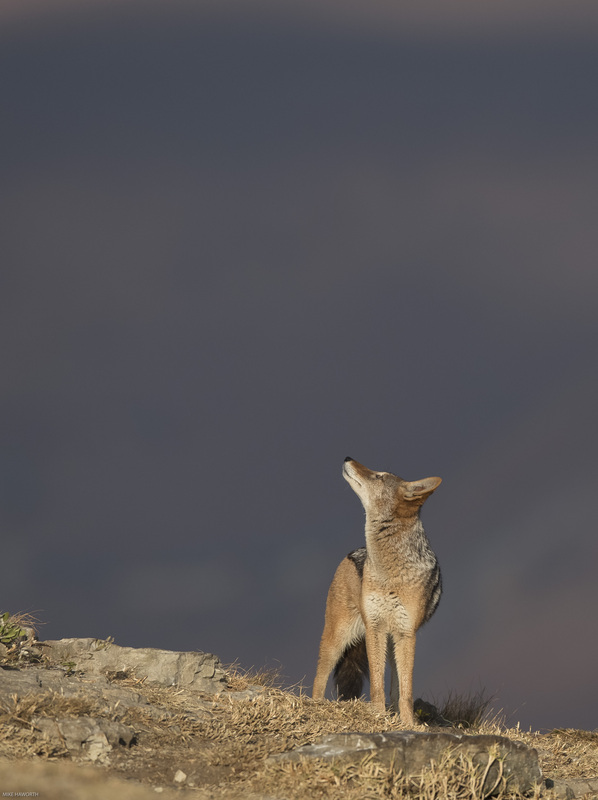 On each of the two days in the hide we saw the Black-backed Jackal. It arrived early in the morning just after sunrise. 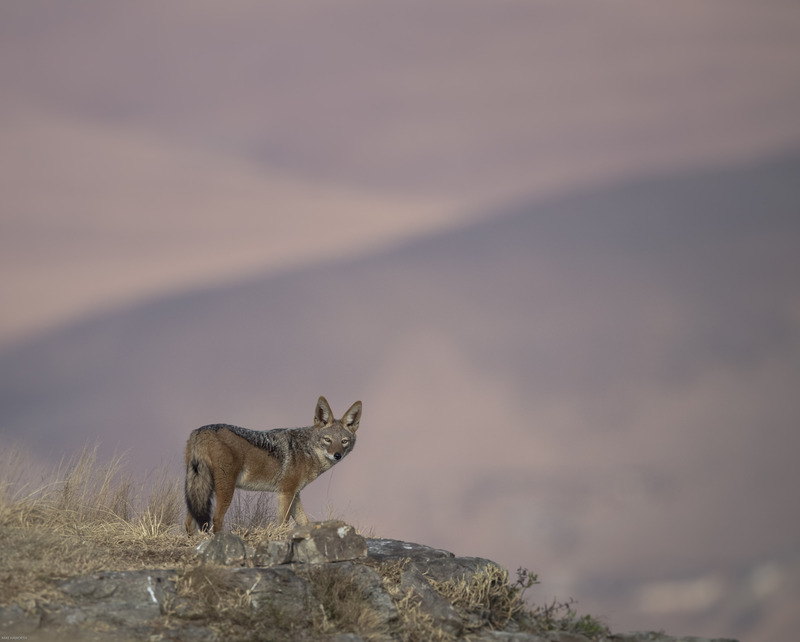 The jackal’s coat appeared much thicker than that of a Jackal found in the lowveld where the temperature is much warmer. It can be very cold in the Berg even in summer. The coldest I have ever been in my life was in mid-November (summer time in the Drakensberg) in the Berg above Injasuti. When we were out hiking a massive thunderstorm rolled in so quickly that we were caught on the side of the mountain for the night in the rain. I have huge respect for the variable weather in the Berg. Hikers and photographers should always be prepared. 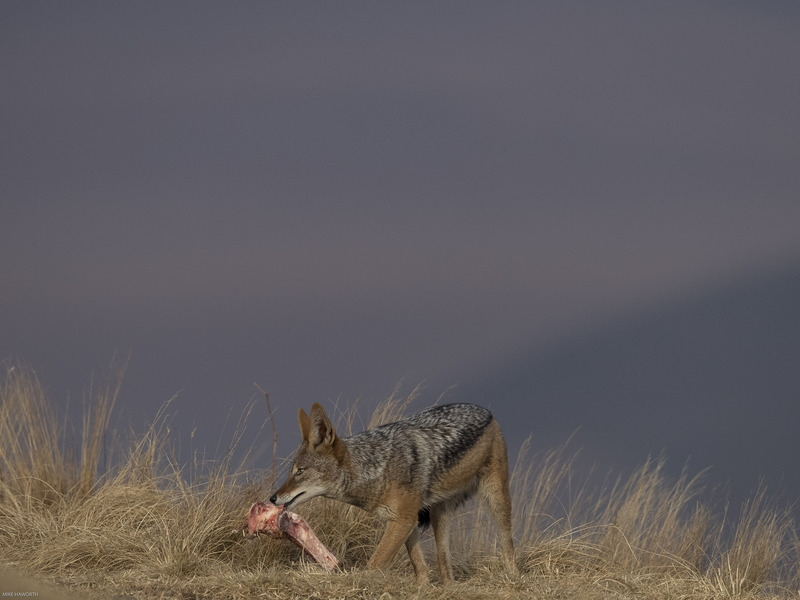 On both days at the hide, the Jackal took a few bones. Presumably it stashed them in the long grass out of sight from the hide and then took them, one by one, back to its den. 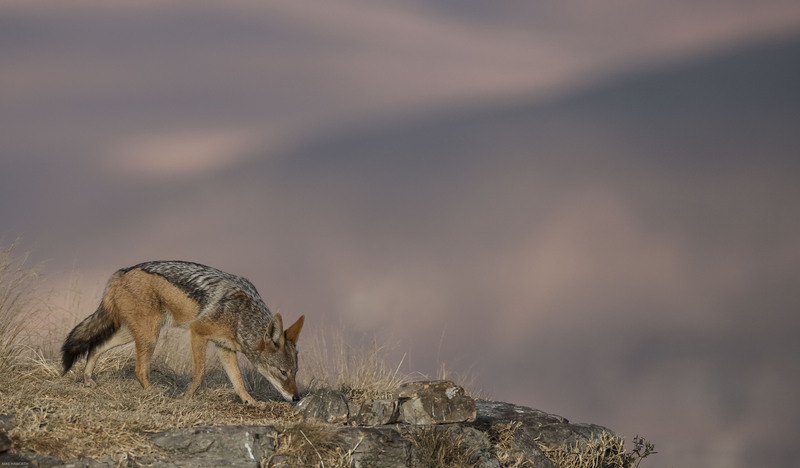 This jackal knows only too well it has competition from the vultures. It must have seen some vultures high in the sky above it. 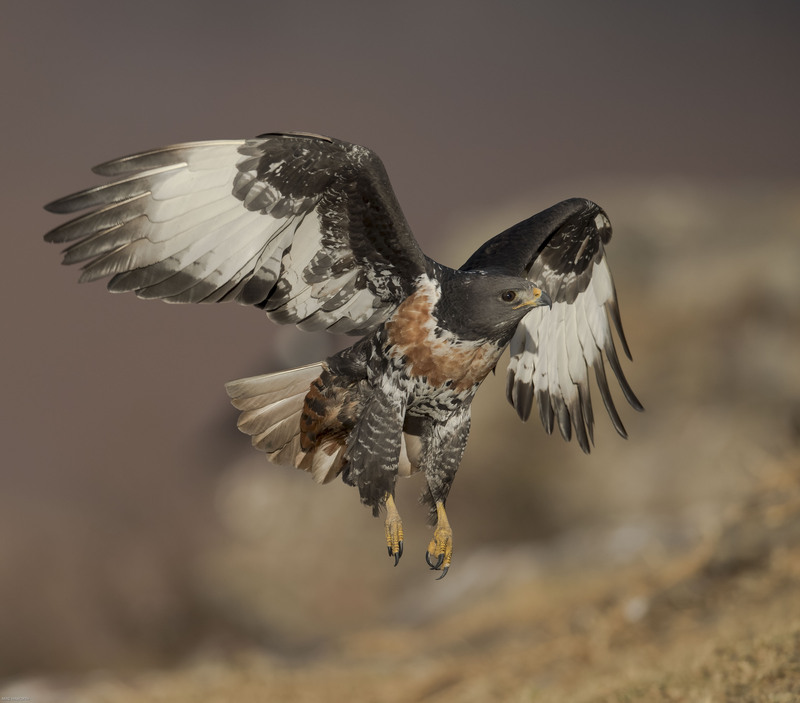 The Jackal Buzzard frequents mainly hilly and mountainous habitats. 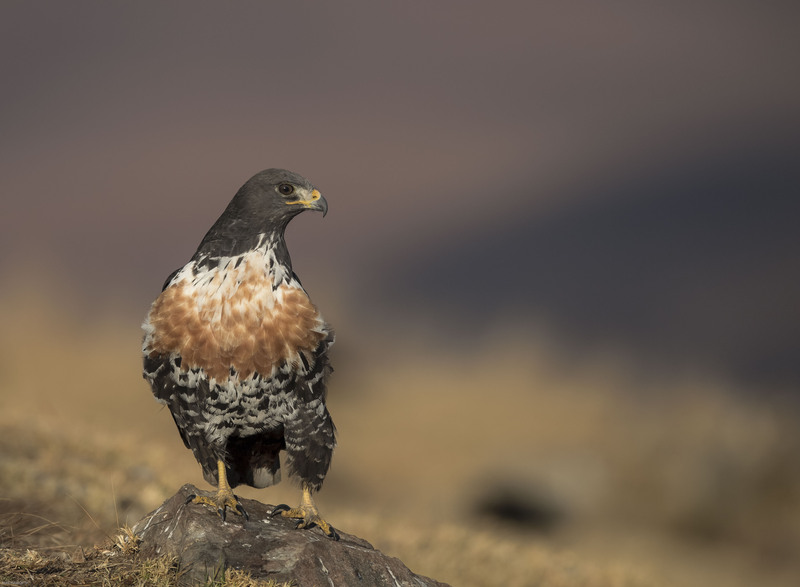 It is one of few raptor species to be found on altitudes above 3000 metres. The nesting season is from July to September, which probably improves the chances of seeing them in late winter to early spring in Southern Africa. The adult Jackal Buzzard has a black head, neck, throat and upper-parts. On the upper-wing, the flight feathers are black, narrowly barred pale grey, and show broad, black tips. It has a rufous chest and rufous coloured tail feathers. On the underparts, the breast is usually rufous with white upper edge contrasting against the black throat, and black markings on the lower edge. Lower breast, belly and under-wing coverts are black with narrow ‘greyish’ white bars. Flanks, thighs and vents are white or rufous. The bill is black with yellow cere. The eyes are dark red-brown. The legs and feet are yellow. 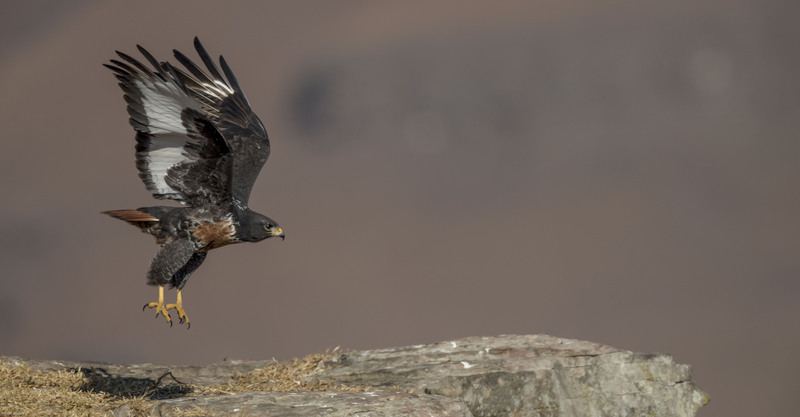 One of the key features of hide photography is that you have to keep watching all the time, ready to capture images of these raptors as they appear in a split second from below the edge of the cliff. You can wait for hours to get a glimpse of them and in two or three seconds they have flown in and landed. The female has similar plumage to the male but she is larger and heavier. “A wise man adapts himself to circumstances, as water shapes itself to the vessel that contains it. The Jackal is dead quiet. 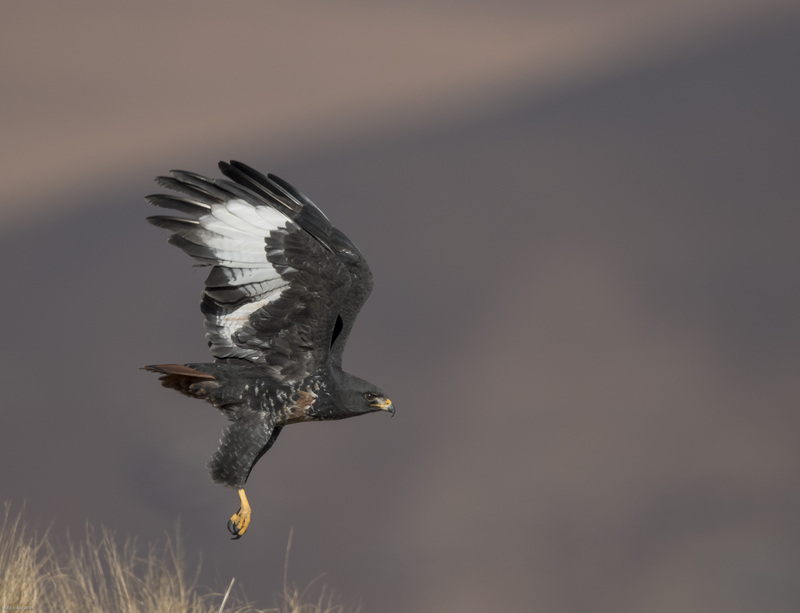 It slinks in at the edge of the ridge, quickly assesses friend and foe and whether there is any potential food and is gone within a minute of so. If you are distracted while making coffee you will miss the photographic opportunity. A Cape Vulture flew in on the second day. It did not go for the bones but just sat on the cliff edge. These raptors are always looking around, probably wary of competition or threats. 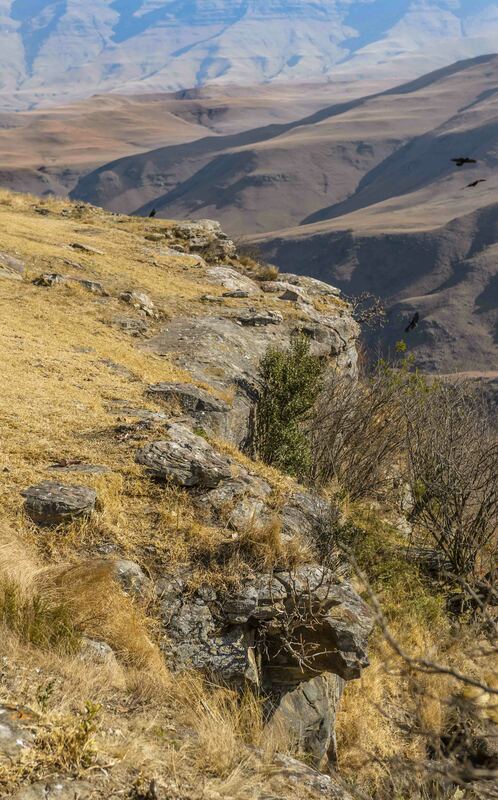 This Cape Vulture sat at the very edge of the cliff so could easily escape by launching itself off the cliff. 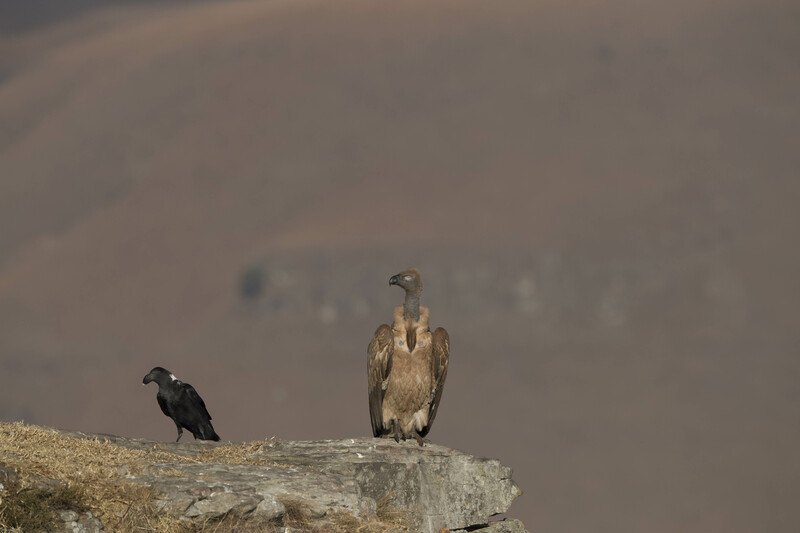 This lone Cape Vulture looked to be just sunning itself on a Sunday morning. The White-necked Ravens know only too well that this raptor has a long flexible neck and can easily give them a savage peck if they venture too close. Once it was rested and had warmed up, it took one hop and it was again riding the updrafts along the ridge. We had a number of visits from the Jackal Buzzards. On this occasion this bird tried to pick up a large joint, but not without some objection from the raven. Having decided the bone was too heavy, it flew off over the edge of the cliff not to be seen again that day. 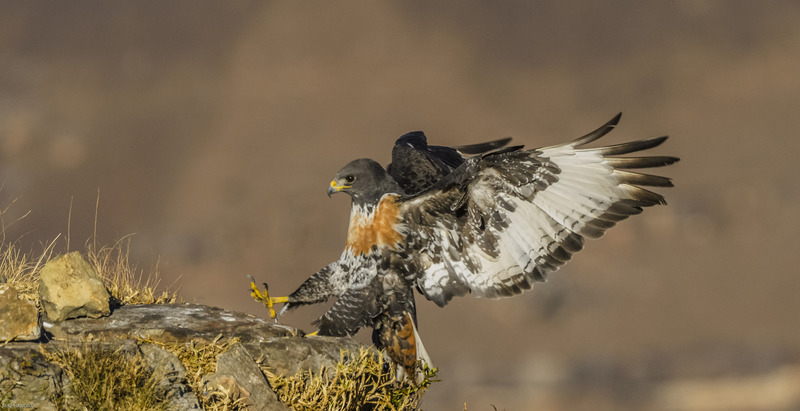 The Jackal Buzzard normally feeds on insects, small reptiles, mammals, birds and carrion. 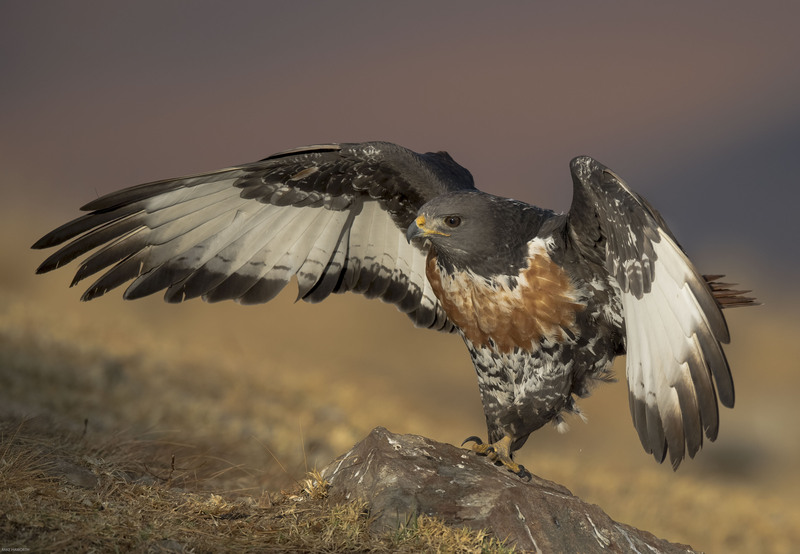 Fortunately, this beautiful raptor is listed as “least concern” on the IUCN Red List.